Four of John Robinson's works may be seen at the University of Wales, Bangor. This page gives you a guided tour not only of the sculptures, but also of an attractive part of Bangor. In the foyer of Top College, in College Rd, we have COURTSHIP DANCE. This graceful sculpture is of two intertwined parts, each of them cut from an ovoid, the symbol of life. It was inspired by the mating displays of the Brolgas, a bird of the crane family, which flock in their thousands by billabongs in Australia. Further details of this sculpture can be found in Gallery 2. From the foyer, you should walk past the Prichard Jones Hall, a splendid example of early twentieth century University architecture. Now go to the Inner Quad. Here the old stone and green lawns contrast with the sharpness of GENESIS. The stainless steel allows for extraordinary reflections. The geometric theme of the sculpture comes from the Borromean Rings, an emblem of the Borromea family of Renaissance Italy. This emblem consists of three rings, no two of which are linked, but which together form a structure which cannot be taken apart. In Genesis, the rings are replaced by rhombuses. Again, further details of this sculpture can be found in Gallery 2. While in this area of Top College, take the opportunity to see the 600 sq ft Edward Povey mural, The Hall of Illusion, in the Powis Hall. It takes an extra leaflet to explain the symbolism in this grand creation, which has an affinity with the John Robinson sculptures in its affirmation and sense of the circle of life. Now leave the College through the foyer, walk straight across the car park with the Prichard Jones Hall on your right. Turn right, and down the steps, to the Terrace. You can sit on the wall and admire the view across the harbour to Penmaenmawr, Llandudno and the Great Orme, or across the valley to Bangor Mountain and glimpses of the Carneddau and, to the South, Elidir Fawr. From here, take the steps on the harbour side of the Terrace, and the path leading diagonally down through the park to the corner of Love Lane and Deiniol Road. Cross at the pedestrian crossing, and walk on away from the College, turning right into Dean Street, where the Department of Life Long Learning is on the left. On the lawn outside the Department of Life Long Learning is CREATION. 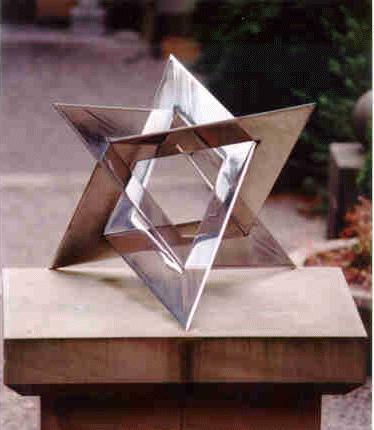 This sculpture is also based on the theme of the Borromean Rings, but this time with a basic shape of a square. The symbolism of the sculpture is that the whole is more than the sum of its parts. Editions of this sculpture are in Barcelona, Zaragoza, and Aspen. Further details of this sculpture can be found in Gallery 2. On the second floor of the School of Informatics you will see IMMORTALITY. The theme of this sculpture, Passing the torch of life, is apt for a University Department. 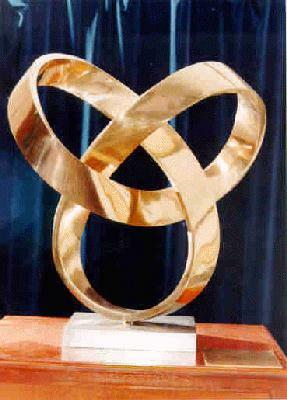 The form of the sculpture, a Möbius Band in the shape of a trefoil knot, reflects aspects of the work of the Mathematics Division of the School of Informatics, on topology, on knots, and on the Popularization of Mathematics. Further details of this sculpture can be found in Gallery 1. The sculptures may be seen 10am to 4pm on working days, or by arrangement. 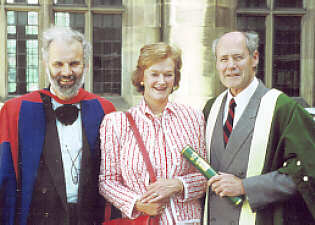 John Robinson was made an Honorary Fellow of the University of Wales, Bangor, in 1992. 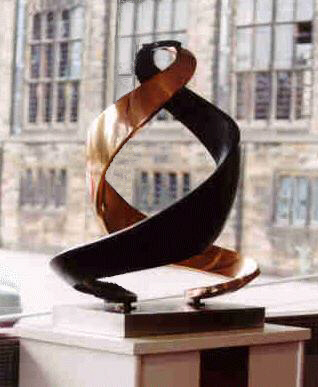 Courtship Dance was purchased by the University of Wales, Bangor, at cost, through the generosity of the sculptor. The Genesis was donated by Harwin Components, Treorchy. Immortality and Creation were donated to the Division of Mathematics and Professor Ronald Brown, by Edition Limitee. This material may be used freely for educational, artistic and scientific purposes, but may not be used for commercial purposes, for profit or in texts without the permission of the publishers.